You know when you find a space that you love and although it looks nothing like your own, you can imagine yourself there. Adri over at Dream Book Design has done just that. It's funny, as she was posting her kitchen remodel and adding brick to her home, I was very curious...brick? But, Wow! 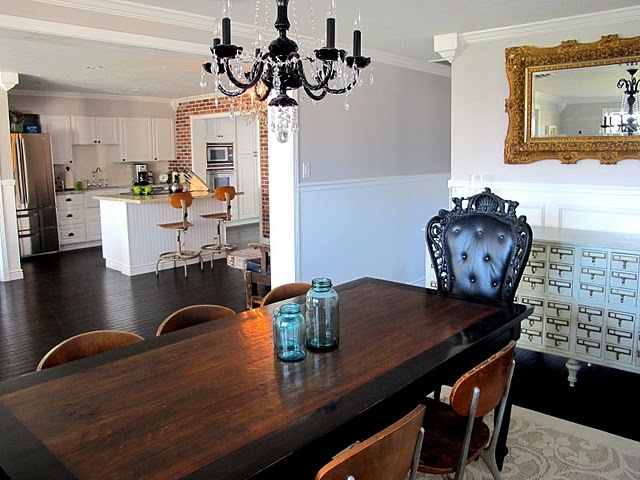 I am amazed by this space and every piece of furniture, lamp, and brick in it. Look at the card catalog, the black chandelier, that black chair, the table, coffee table, couch, I could keep going. Really? Amazing! You must go and check out their latest project, they made a new dining room table out of a vintage drafting table﻿. Love you and Adri's eye for style! I absolutely must have those end chairs at some point in my life!! Also love the mixtures of black with rustic wood! xox! I love this house! What a great mix of elements and unexpected touches. I also love your blog. I'm glad you found mine and yes there is a direct reference to Miami with the cuban in my coffee:) I will be following you as well. We seem to have some similarities with our DIY projects, and I can't wait to see what you do next. I'll be back for sure! YES! I've seen her blog before, I love love love her house. 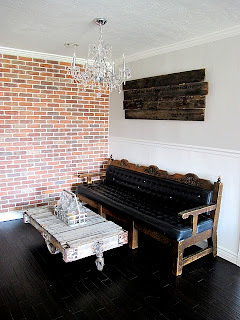 A few rustic touches definitely adds a nice texture to a space. And, that card catalogue is amazing!!!!! I - LOVE - EVERYTHING ! !